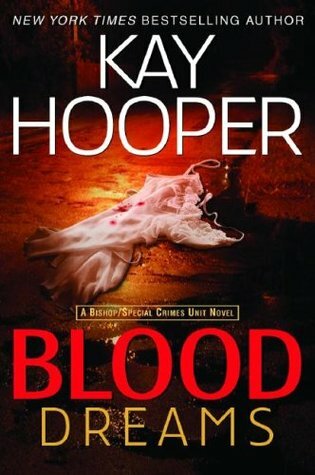 Blood Dreams has a fantastically gory, bloody start and actually made me wonder whether the previous Kay Hooper Bishop/SCU books had been this gory. I recall them having emotionally trying themes that gave you a sense of depressed horror that such atrocities could occur (because even without the paranormal aspects, the kinds of crimes depicted in these books are entirely possible). And so it makes you really think. But Blood Dreams definitely gave me a start with the bloody mess of a murder crime scene not for the faint of heart. With the exception of some mellow moments, the book was a progressive, intense murder investigation from beginning until the end, with and introduction of the civilian paranormal investigation organization, Haven, created by John and Maggie Garrett (from Book #4, Touching Evil) and few of their main investigators. Well-written and wonderfully intriguing, it had me hooked from the beginning. Again, there are great characters to follow and I find myself wanting so much more story from the world of the Bishop/SCU series. A serial killer leaves his playground in Boston after killing a powerful Senator's daughter and eleven other women. He picks up again in Venture, Georgia and the body count so far seems to be at two. But his M.O. seems to have changed, for one, and there may even be two other victims already. The blood crime scene alone suggests that the bodies of two different women were cut up and dumped there. Then Hollis Templeton enters the scene and, as a medium, sees the spirit of a woman who is not either of the currently reported missing women. DNA evidence also suggests that a third woman has been victimized. At the same time, Dani Justice has been having the same recurring dream vision involving a sense of urgency as well as a potentially grisly death of herself and fellow investigators, possibly tied to the serial killer running around Venture. Finally, the story flips back and forth between one group of characters and another with their own independent investigations on the same case, same serial killer. Toss in the Universal Evil ideals... and things start to spiral a bit out of control. First of all, as usual, I love the characters in the Bishop/SCU world! They are fleshed out and have their own unique traits, even if everyone ultimately falls under the same category of "Paranormal Investigator, Fighting Unknown Evils to Save the World" types. As already stated, the characters are great, the story is smoothly progressive, and the main conflict was straight forward. The book is well-written and there aren't too many random tangents that linger on unnecessary filler plot. The great investigative team with their banter and their bouncing around of ideas during team meetings and procedural investigation. There's nothing more intriguing to me than being able to see great character interaction and teamwork in the face of solving a significant problem; in this case, a serial killer's rampage. The romance was a bit in the backseat area, but for this story, it worked. It was a no angst love story. And while I would have liked a little more balance of romance-to-suspense within this Paranormal-Romantic-Suspense novel, I found myself so much immersed in the active investigation that I actually had a rare "Romance? What romance?" moment. So the diluted love story didn't really bother me as much. Nonetheless, all the characters make great friends and partners... which makes it a little hard to discern how I felt about the main couple's romantic chemistry. The recurring dream with its slight difference and some sort of hidden message that we can't seem to figure out... I thought it was really intriguing and I loved it. I. Loved. Hollis Templeton! Even though she's not the main character in this book. She's got a great, dryly sarcastic attitude and a strong enough exterior to hide her inner turmoil. But she's straight forward about how she feels even if she doesn't show it. And finally, this book had its creepy moments. I mean, like, the good creepy kind of creepy moments. There were only a few things that bothered me about this book, and in fact is an ongoing issue I have with the Bishop/SCU books. But as I love the world and it's characters, I've been giving it a bit of leeway. The series continues to boast the "Universe" as the ultimate go-to for all questions that can't seemed to be answered. Which would be fine if we didn't always go to the "Universe" as the cop-out response for almost everything. I accept that, within a paranormal world that is trying to conform to a more realistic setting, we're still trying to keep things real. The "scientific" explanations and lab experiments mentioned that are used to research paranormal events and psychic abilities has always been interesting to me in these books and I would have liked to explore these things more. But when something can't be explained, rather than just saying so, our characters are always referring to that great and all-knowing "Universe." To me, that puts all their fates and the fates of all people in the category of some higher power that already has all of life planned out. Which makes me feel like these people have no power over what happens in their lives because everything happens for a reason. Because the "Universe" arranges everything to happen the way they need to happen. That repetitive "Things have to happen the way they happen" mantra is also becoming a little overused, and honestly need only be mentioned once or twice in a book... not several times. There is a strangely detached tone that is quite apparent in the narration of the book that makes it a little hard to relate with the characters. For characters that were created so awesomely on paper, it's a little disappointing that they don't feel as readily awesome in action. Despite spending more time with Dani Justice and Marc Purcell, it doesn't escape me that they aren't as memorable characters as Hollis turned out to be. Don't get me wrong, I liked Dani and her twin sister Paris. I also liked Marc as well. But they stood out just as much as the rest of the newly introduced side characters and Haven operatives did, which is a little disconcerting. These books, despite having great characters, are fairly plot driven rather than character driven. I don't mean that in a bad way; I'm just more interested in following character-driven stories. Nonetheless, I really enjoyed this book, quibbles and all. Not much else left to say except for how readily I continue to move onto the next book.